What’s the first thing that comes to mind when I say summer supper? That’s what comes to my mind. With Fourth of July just around the corner, I decided to make something I feel is truly a staple around the American table. But I did put a healthy twist on it. I know what you’re thinking. Where’s the bun, right? There’s just one of me, and I don’t let Annie have anything other than dog food. So the pack of eight hamburger buns would just go to waste. Plus, I’ve found I feel better when I eat less bread-like products. That’s just my personal preference. But this burger is not boring. It’s a homemade ranch burger. I mixed dried dill, dried parsley, onion powder, garlic powder, a smidgen of thyme, salt and pepper into the meat before I cooked it. I won’t make a burger without it ever again. 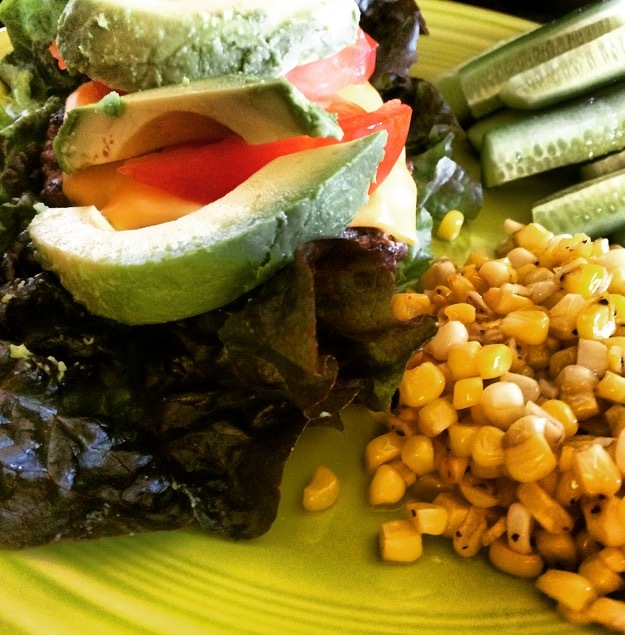 I used red leaf lettuce as a bun and topped my burger with cheese, tomato and avocado. 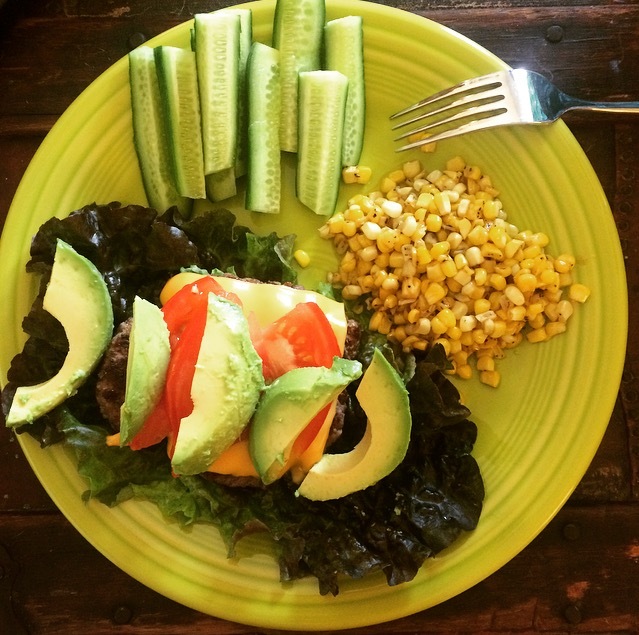 The sides of cucumber sticks and fried corn were the perfect addition. I’m not sure fried corn is actually a thing. But it’s one of my things. A guy at my office was passing out sweet corn the other day. So I cut it off the cob and fried it in some Kerrygold butter with salt and pepper. And by fried, I mean sauteed until corn is done, and the butter has created this melty, delicious sauce. I could eat this corn by the bucket. So delicious and simple. The key is the good Kerrygold butter. And corn grown in someone’s backyard. I hope your Fourth of July weekend is filled with lots of All-American things. I plan to be on some body of water soaking up the sun and enjoying some awesome fireworks show that night. There will be beer somewhere in there.